1 Mix the watermelon flesh with the sugar and lemon juice and leave to stand for about 1 hour. Soak the gelatine in cold water. 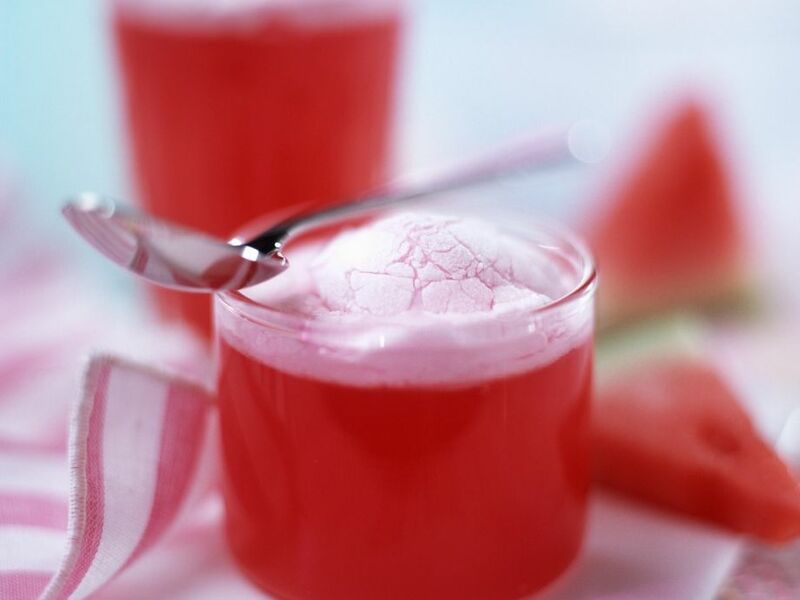 2 Push the watermelon through a sieve, reserve 1 tbsp of the melon puree and make the rest up to 500 ml with apple juice. Heat a little of the liquid, squeeze out the gelatine and stir into the heated liquid to dissolve. 3 Add the rest of the watermelon liquid, stand the container in a bowl of cold water and stir until the mixture begins to set. Transfer to 4 individual moulds. 4 Whisk the egg white very stiffly with the sugar and mix in the reserved melon puree. Then pipe a blob on the top of each jelly. Stand the moulds in a baking dish filled with cold water and put in the oven at 200°C | 400F | gas 6 for 5 minutes. 5 Then put into the fridge for about 3 hours to set. Served dusted with icing sugar.